SEOUL, Republic of Korea - The U.S. and Republic of Korea (ROK) navies enhanced their combined and joint maritime capabilities after completing a series of drills and exercises ashore and at sea from March 8-31 in support of exercise Foal Eagle 2014. Exercise Foal Eagle in an umbrella of regularly scheduled, annual exercises that are the culmination of many months of planning and based on realistic training scenarios. The naval portion of the Foal Eagle exercises took place in international waters around South Korea and featured a full spectrum of joint maritime operations designed to strengthen the interoperability and teamwork between U.S. and ROK military forces. This year's drills marked the 53rd Foal Eagle exercise, which included participation of USS Lassen (DDG 82), USS Curtis Wilbur (DDG 54), USS Lake Erie (CG 70), USS Howard (DDG 83), USS Avenger (MCM 1), along with Korean Aegis destroyers ROKS Sejong the Great (DDG 991), ROKS Seoae Ryu (DDG 993), and ROKS Gwang Geon (DDH 978). Additionally, exercise Foal Eagle 2014 included the U.S. Navy's P-8 Poseidon maritime patrol aircraft for its first training missions in Korea. "Exercise Foal Eagle is important to the alliance because it brings units from other regions to Korea and allows them to work in a joint environment with our ROK navy counterparts, improving our joint fighting effectiveness," said Cmdr. David Suchyta, director of operations for Commander, U.S. Naval Forces Korea. "The ROK and U.S. alliance is built on trust and that trust grows from working together. This exercise provided new generations of U.S. and ROK Sailors the opportunity to work together and build that trust." 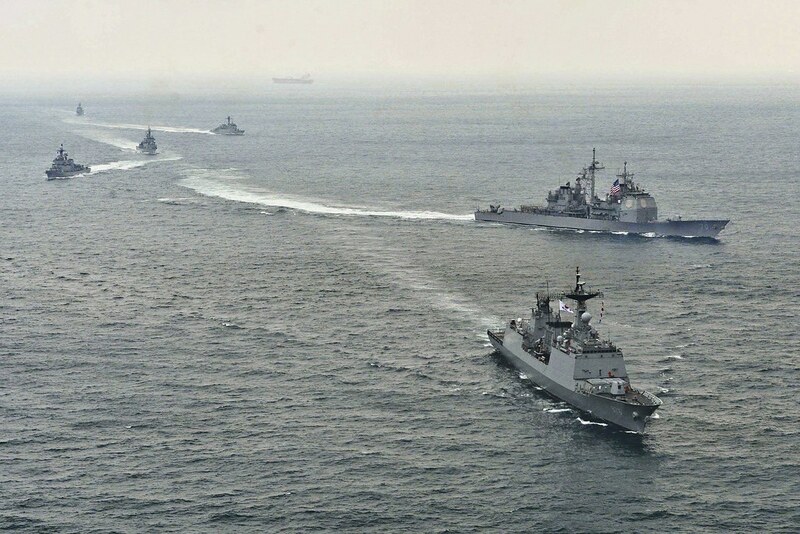 The training incorporated scenarios such as gunnery exercises, communication drills, dynamic ship maneuvers, logistical rehearsals, and liaison officer exchanges with the ROK navy. 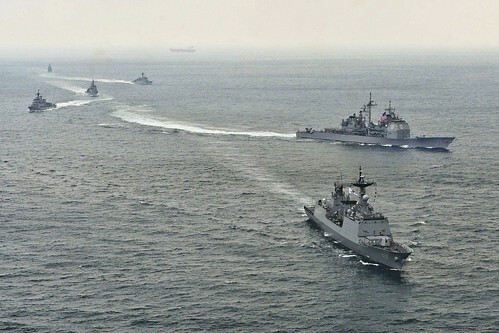 Since the U.S. and ROK mutual defense treaty was signed on Oct. 1, 1953, the U.S. Navy has had routine presence in waters around the Korean peninsula conducing combined and joint exercises like Foal Eagle, demonstrating the enduring commitment to the alliance and the defense of the ROK. "We were honored to work side-by-side with our U.S. Navy counterparts during the Foal Eagle exercise," said Cmdr. Kim, Beom Woo, of the Republic of Korea Fleet headquarters in Busan. "Through the hard work of our Sailors operating at sea together, we enhanced critical maritime skills and strengthened the alliance between the U.S. and ROK navies."